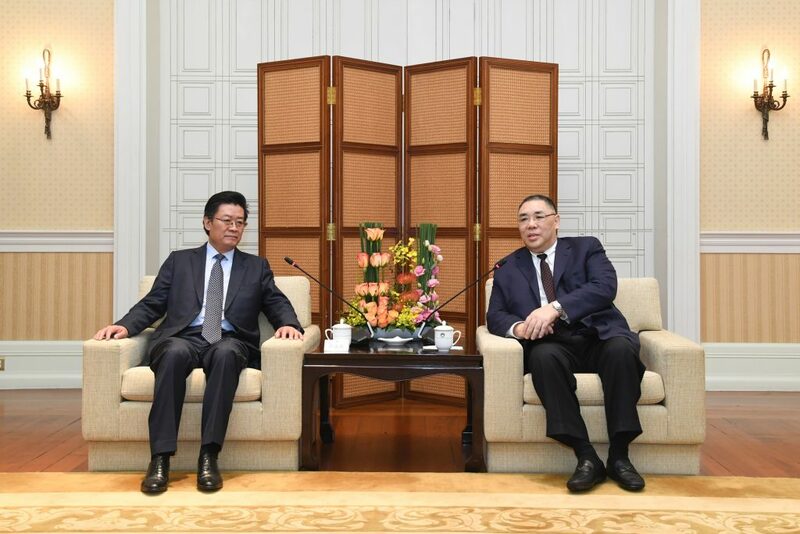 Macau Chief Executive Office Chui Sai On met with CPC Zhuhai Municipal Committee Secretary Guo Yonghang and Zhuhai Mayor Yao Yisheng on 4 April to exchange views on further deepening Zhuhai-Macau co-operation and the strengthening of ties in areas such as finance via Hengqin. Chui Sai On welcomed Guo and his delegation and recalled that Macau and Zhuhai have established an cooperation relationship, primarily through the Guangdong-Macau Cooperation Framework Agreement. He reiterated his belief that it will benefit further cooperation between the two territories. Chui underscored the importance of strengthening regional cooperation, the development of Macau’s financial sector and its integration into the development of the Greater Bay Area, noting the significance of these measures for the adequate diversification of Macau’s economy and sustainable future development. In turn, Guo gave a brief presentation on development trends in Zhuhai before pointing out that the cooperation opportunities between the two territories are numerous due to the launch of the Greater Bay Development Plan and the soon to open Hong Kong-Zhuhai-Macau Bridge. Regarding Hengqin’s exploration, Guo believes that both governments can take advantage of existing policies for the development of high quality services, tourism and cultural and creative industries, together maximizing the potential of the island. Zhuhai will also use Hengqin Free Trade Zone as a platform to strengthen cooperation in key areas such as finance and efforts will be made to build the FTZ into a Guangdong-Hong Kong-Macau in-depth cooperation demonstration zone. Meanwhile, the Secretary for Economy and Finance, Lionel Leong, who attended the meeting, reiterated that in recent years, cooperation between Zhuhai and Macau has been more active and effective. He added that the consolidation of regional cooperation is an important policy to support the adequate diversification of Macau’s economy. The secretary believes that the cooperation of these two cities, especially on Hengqin Island, will advance further. The 12th China-LAC Business Summit was held at the Zhuhai International Convention & Exhibition Center in Shizimen Central Business District from 1 to 3 November. Guangdong-Macau Cooperative Development Fund Management Co. will invest RMB2 billion to ensure completion of Hengqin Science City Phase I by 2021 and the inception of Phase II. Trial operations of the submerged Hengqin Tunnel – Zhuhai’s first underwater passageway and the first sea-area composite large-diameter shield tunnel in China – commenced on 1 November. On 23 October, Chinese President Xi Jinping announced the opening of the Hong Kong-Zhuhai-Macau Bridge at an opening ceremony in Zhuhai. Covering the 41st to 72nd floors of the 330-meter Zhuhai Tower, the luxury hotel features a signature butler service and world class dining. Australia’s Ashleigh Barty achieved the biggest win of the year after taking out the 2018 WTA Elite Trophy Zhuhai at Hengqin International Tennis Center on Sunday. The 2018 Hengqin-Macau Youth Entrepreneurship Training Camp held its opening ceremony on 26 October in Inno Valley HQ in Hengqin.